You can prepare a profile of what radio and/or TV stations can be heard in a collection of one or more defined zip codes. You can prepare a profile of the zip codes where a collection of one or more radio and/or TV stations can be heard. You can prepare a profile of the counties where a collection of one or more radio and/or TV stations can be heard. All three types of reports export to Excel. These new features will allow you to better describe the specific geographic reach potential of radio and TV stations. It also provides you with analytical tools for geo-targeting. 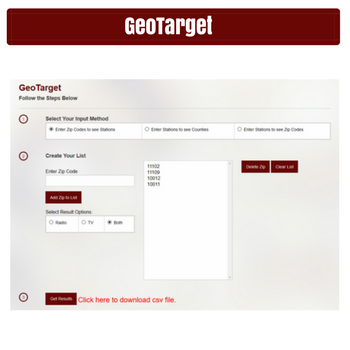 Please contact us in order to learn more about the benefits of having access to the GeoTarget feature.